The Costa de la Luz ("Coast of Light"), Spain's southwestern coast, overlooking the Atlantic Ocean, has beautiful beaches, hotels and golf courses, and areas that lend themselves to surfing and diving. Here the climate is Mediterranean, with mild and relatively rainy winters and warm and sunny summers. However, there are some differences that are worth considering: the western part is hot in summer, with highs around 30 °C (86 °F) in July and August, and a greater likelihood of hot days, while the eastern part, and in particular the south-eastern tip, overlooking the Straits of Gibraltar, is mild and windy. In winter, very cold days on the Costa de la Luz are rare, though cold periods, with minimum temperatures dropping to 0 °C (32 °F), can sometimes occur. Let's start from the west. 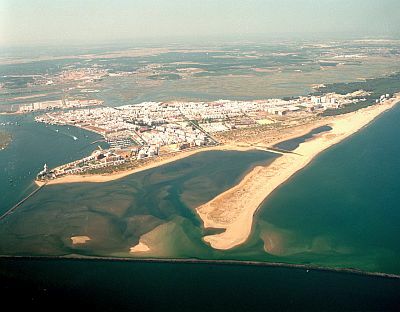 In the westernmost part, the mouth of the Guadiana River, which marks the border with Portugal (where we find the region of Algarve, see Faro), is divided into branches, among which we find some islands: Isla Canela, Isla del Moral and Isla Cristina. Further to the east, we find the towns of La Antilla and Islantilla. More to the east, in the area of the mouth of the Rio Piedras, we find the coastal towns of El Rompido and El Portil. We are in the province of Huelva: the capital is located more to the east, near the confluence of the rivers Tinto and Odiel, a short distance from the coast (on the coast near Huelva we find Punta Umbría). Here the daily average temperature ranges from 11 °C (52 °F) in January to 25.5 °C (78 °F) in July and August. In Huelva, in summer the daytime temperatures are already 2/3 degrees Celsius higher than on the coast, and at times it can be very hot (though more rarely than in the interior of Andalusia), with highs around 35/37 °C (95/99 °F). Here are the average temperatures of Huelva. The rains in Huelva are not abundant, since they amount to 530 millimeters (21 inches) per year, and follow the Mediterranean pattern, in fact most of them fall from October to April, while in summer it almost never rains. The rainiest month is December, with 105 mm (4.1 in). In Huelva, the amount of sunshine is very good in summer, when clear skies prevail, but all in all it is decent even in winter, when bad weather alternates with sunny periods. While on the coast the summer temperatures remain typically acceptable because of the sea breeze, in the interior we find a particularly hot region, the valley of the Guadalquivir, the area that in summer is the hottest in Europe (see Seville, Cordoba). Continuing to the east, around the beach resort of Matalascañas we find the Doñana National Park, a UNESCO World Heritage Site, rich in biodiversity, with many species of birds that find refuge in the numerous lagoons. On the coast facing south-west, there are large beaches with sand dunes. The temperature of the sea in the western part of the Costa de la Luz remains very cool even in summer, since the waters of the Atlantic never heat up much, as we can see from the sea temperature near Isla Canela. Beyond the mouth of the Guadalquivir we enter the province of Cádiz, where summer tends to become oddly less warm as you head south. Here we find places like Chipiona and Rota, where there's an airport. In Rota, the summer temperature is still quite high, however, compared to the western part of the coast and in Huelva, very hot days are less frequent. On the other hand, sometimes there can be quite cool days because of the east wind (Levante), with highs around 24/26 °C (75/79 °F) even in July and August. This wind in Rota is intermittent and only blows at certain times, but becomes more frequent and intense as you head southeast. Here are the average temperatures of Rota. Southeast of Rota there are a number of cities very close to each other, but separated by bays and river branches: El Puerto de Santa María, Cádiz, located in the bay of the same name, the nearby cities of Puerto Real and San Fernando (the latter is an island, although it was artificially connected to the mainland), and finally Chiclana de la Frontera. The beaches in this part of the coast are Playa de la Barrosa and Playa de Sancti Petri. Here are the average temperatures of Cádiz, which tend to be mild because it is surrounded by the sea. In summer, the east wind can blow here as well, causing some pretty cool periods. Continuing along the coast towards the south-east we find towns like Roche, Conil de la Frontera, El Palmar, Zahora and Cape Trafalgar, beyond which we find Barbate. 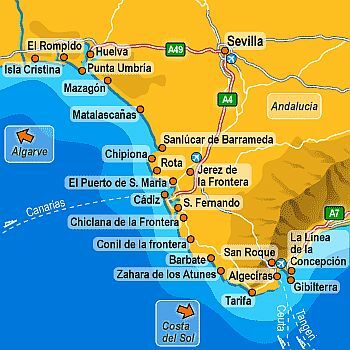 From this area we enter the area of the Strait of Gibraltar, which in summer is particularly subject to the cool Levante wind, and thus has a particularly mild and windy microclimate, even cool in the southern tip where we find Tarifa. Here are the average temperatures of Tarifa. 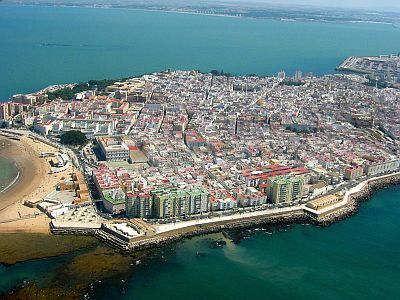 The temperature of the sea in the province of Cádiz is similar to that of the province of Huelva, and remains cool also in summer, however, it's slightly warmer, and reaches 22 °C (72 °F) in August and September, as can be seen from the temperature of the sea near Conil de la Frontera. The best period to visit the cities of the Costa de la Luz, for walks and hikes, corresponds to the months of April, May and October, especially if you plan an excursion to the interior of Andalusia, which in summer is often scorchingly hot. For a beach holiday the best time is instead the summer, from June to mid-September. It is advisable to bring a sweatshirt for cool and windy evenings, especially in June and September, but for safety, also in July and August, especially in the eastern part, that is, the province of Cádiz.